During the Measure 91 campaign, economic firm EcoNorthwest projected that the state would bring in $38.5 million in new revenue the first year while the state of Oregon projected a more modest $9 of net revenue. If the first week of sales are any indication, the higher projection by EcoNorthwest may just be the more accurate number, if not a conservative estimate itself. Sales in Oregon were booming the first week that medical marijuana dispensaries could sell cannabis flower to adults 21 and over. Of course, Marijuana Politics was there to cover the first day of legal cannabis commerce in Oregon. One week in, Oregon is already far ahead of dollars spent on pot compared to Colorado’s first week of legal recreational sales, at $5 million. Washington took a month to sell its first $2 million, according to Marijuana Business Daily. When Oregon voters approved recreational marijuana, the state set an estimate of $9 million in net tax revenue for the first full year of 2017. But the Oregon Retail Cannabis Association believes it’ll bring in three to four times that much. As KGW notes, a 25% tax goes into effect the beginning of 2016 at the medical dispensaries selling cannabis flower to adults. State-regulated recreational retail outlets that will sell more cannabis products, including edibles, topicals and concentrates aren’t expected to be open to the public until September or October of 2016. The state-regulated retail stores will then be taxed with a 17% state tax while localities can impose an additional 3% tax. If the $11 million dollar sales mark would continue for an entire year, the state would generate more than $97 million a year with a 17% tax. Sales may drop off a bit as the newness of state-licensed cannabis commerce wears off and when taxes begin, but that drop off may be countered by the new marijuana products that will be available later in 2016. Whether the $11 million a week number keeps up, or the sales dip a bit, it is easy to see that legalizing, regulating and taxing marijuana will generate plenty of revenue for the state of Oregon, while creating jobs and better prioritizing law enforcement resources. 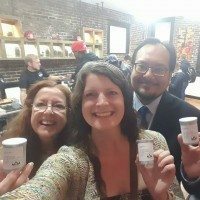 I, and others, have often stated that Oregon’s cannabis industry will follow in the footsteps of Oregon’s microbrewery and winery industries, creating a new industry that the state can be proud of. If the first week of sales are any indication, the marijuana industry in Oregon will quickly outpace the tax revenue generated by beer and wine, as the state collects about $17.65 million a year in beer and wine taxes. Prohibitionists used to claim that revenue from legalizing cannabis wouldn’t materialize, but it looks like they will have to move onto another false claim as Oregon has already proven that there are plenty of residents who have been waiting to engage in regulated cannabis commerce.